I’m not sure, but I think that this was the first Christmas that we’ve had an inside dog at Mama’s for Christmas since Janet Planet went with us down there. 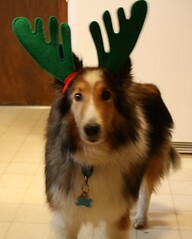 Casey was such a GOOD DOG. 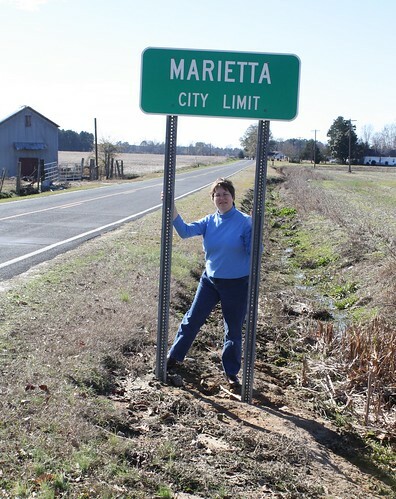 Sandy and I have been meaning to take photos of ourselves with the Marietta City Limit sign for a long time. The city limit sign used to be in the middle of “town” and the signs were on either side of one post. Marietta has since expanded but as you can see, the houses did not. I’m standing in mud because this ditch was full yesterday. I lived about a mile down this road in the heart of Marietta, North Carolina. 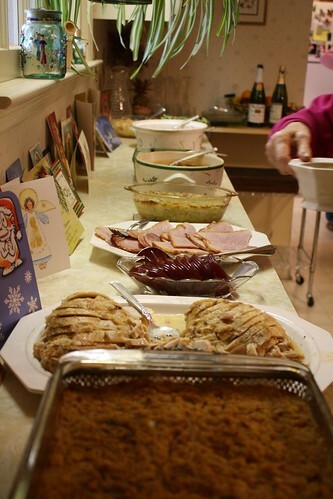 We had twelve people at Christmas dinner, including my nephew, who I think is one of the coolest people in the world. I’ve decided that my New Year’s resolution will be to learn to play blues harmonica and speak Italian so that I can convince him that I am the coolest aunt in the world. I spent a good bit of time fretting over Theo’s health, because when we left he had been throwing up for a few days and was a little lethargic. I convinced myself that I was worrying for nothing because today is the anniversary of Squirt’s journey over the Rainbow Bridge. And I was. When we got back, there was no vomit and he was playing hard and pretending like he didn’t know me. Damned cat. I’m really looking forward to this week at home.